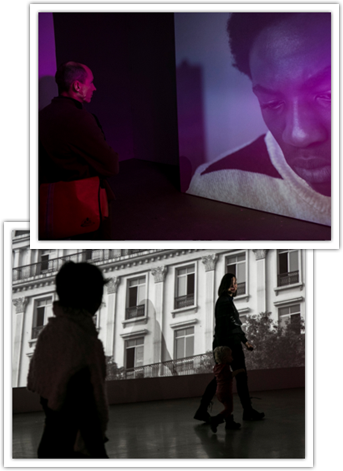 Panasonic projection technology brings to life the Danish artist's latest video installation in Stockholm. The Danish artist Jesper Just’s new video installation touches on our senses of reality. Furthermore, it’s a testament to the many new possibilities in an art world that is becoming more and more technically advanced. The video installation is brought to life by seven Panasonic projectors. Jesper Just himself chose the technical set-up. 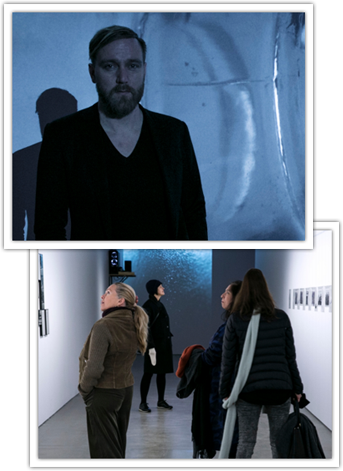 The internationally recognised Danish artist, Jesper Just, exhibits his video installation and multiscreen projection, Intercourses, at the exhibition City Walks in Bonniers Konsthall in Stockholm. The art show has been a great success so far with footfall far exceeding all expectations – it is actually the most popular exhibition of the year. The first thing you notice as you enter Bonniers Konsthall is Jesper Just’s video installation of three men roaming around the Eiffel Tower. Jesper Just is alongside five other artists exhibiting under the same theme dealing with how people live and maintain themselves in a modern city. Intercourses is Jesper Just’s most complex video installation so far and poses questions of how today’s cities grow at an incredibly rapid rate, and how this trend is fuelled by increasing migration and urbanisation. The imagery and lights feel so real that for one second you are certain that you must be in Paris. Only you are not. Because Just’s Paris is not the Paris you know, but a replica city built in Hangzhou China, which in example reveals exactly how Just manages to play with our sense of reality. “I experienced how the Panasonic solution was superior to other solutions by competing brands when the installation was exhibited in Denmark. The Panasonic image quality and colours are just stunning,” says Jesper Just. Jesper Just was part of the technical team responsible for setting up the technically complicated video installation in Bonniers Konsthall. The technical team used four 3-chip DLP™ PT-DW100 projectors and three 1-chip DLP™ PT-DZ870 projectors from Panasonic to create a spectacular visual experience. “Panasonic projectors are very reliable and long lasting. We have some projectors, which we have used intensively for as long as up to seven years and they are still in perfect condition and running. There’s no fluctuation even if the projectors have been running constantly for days,” says Chief Operating Officer at Informationsteknik Patrik Camp. “I was quite overwhelmed by Jesper Just’s installation. It is the masterpiece at the exhibition and the visitors have been amazed so far. It’s like stepping into another world of urban environments,” says Event & Sponsorship Manager at Bonniers Konsthall Thérèse Dyhlén. She explains how most people instantly can relate to the theme as they have firsthand experience with living most of their lifes in big cities. Bonniers Konsthall was very happy with the exhibition opening, which generated an unseen amount of discussion on social media. “The success went beyond our wildest expectations. The first month we had 15.000 to 20.000 guests which is more than double the amount we usually see at events like this,” says Thérèse Dyhlén from Bonniers Konsthall.